In June 2018 I ended a long-term relationship. I did what a lot of independent, strong-willed women ending relationships do - created a bucketlist! “Spend a few weeks working remotely from Belize” was at the top of my list. A few weeks later I read a blog post about traveling “on-the-cheap” from one of my college friends/accounting guru/ overall Girlboss badass, Danetha Doe, founder of Money and Mimosas. It was destiny! But, I was slammed with Grit HQ (a great place for a business owner to be). I continued to engage in social media jealousy at my Digital Nomad girlboss Instagram friends, read articles about Central and South American cheap traveling, delicious food and beautiful, warm weather, and the “Go Slow” lifestyle of Belize, especially Caye Caulker. A guy I was dating took charge and made my bucketlist a reality. We decided to make it a duo adventure to work remotely while traveling internationally without hurting our pocketbooks. #1 - Know there’s a difference between “having wi-fi” and having GOOD wi-fi. In Caye Caulker, Belize there is wi-fi everywhere! Every Belizian restaurant, every hostel, and every touristy place has wi-fi. But, most of the internet is worse than airplane wi-fi. So, if you’re planning to take a go-to meeting, download or upload videos, or work through any web-based portal (Including Squarespace), be careful. Ask your accommodations directly if they know the upload/download speed of the internet. Download the SpeedTest App and see how the wi-fi is before you decide to set up shop for the day. Ice and Beans (best coffee on the island, Karen and Mario (the owners) are solid! Our awesome AirBnB, Sandcastle - awesome place to stay if you’re a diver (the owners are) or wanting to splurge! #2 - Wind, street vendors and stray dogs are your enemy! GOOD IDEA - Take a conference call in the pool at your semi-private, jungle-set, off the beaten path AirBnB. GOOD IDEA IN THEORY ONLY - Take a conference call on the beach by the busiest coffee shop on the island. This quickly became “My +1 leaning over a bug-filled dumpster (the only side of Ice and Beans that doesn’t have a beautiful ocean breeze), dodging island dogs, beach chickens and the many backpackers parking their bikes to walk to The Split”. There might have even been a street vendor selling coconuts yelling and chuckling with tourists about the stray dogs mating. So, if you need to take a Zoom call or Google Hangout, learn from my +1’s failing forward. Take it from a controlled environment with high-speed internet - most likely your hostel or AirBnB. #3 - Be very aware that everything runs on island time. Unless you are grabbing a Fry Jack or treat from the bakery, plan on even a quick meal or “grabbing a bite” to take at least an hour and 45 minutes. Even Chef Kareem’s UnBelizeable BBQ (literally a dude with a grill making delicious, fresh-caught, straight to the grill lobster) takes over an hour. #4 - Rent a bicycle! Bicycles are the primary mode of transportation on Caye Caulker. In fact, there is only one truck, one firetruck and one other car on the island. So, Don’t be that shmuck tourist that decides to get a golf cart, especially if you’re near The Split. You can easily walk or bike anywhere on the island in under an hour. No matter where you stay, I highly recommend renting one while you’re on the island. Our awesome hosts supplied ours for free. #5 - Go snorkeling at Hol-Chan Marine Reserve. Caye Caulker offers some of the best snorkeling in the world! Around the World with Justin says Caye Caulker snorkeling is the best in the world! As a farm girl, I’m not the biggest fan of marine life. But, it was beautiful! And, we saw ALL OF THE marine life in one 4-hour trip! I highly recommend Anwar’s Tours for snorkeling! We saw sharks, beautiful coral, a gazillion stingrays, sea turtles, sea horses, crabs, two long, creepy barracudas, all of the fish and more. My +1 did the half-day snorkeling tour with tour guide Andrew TWICE. 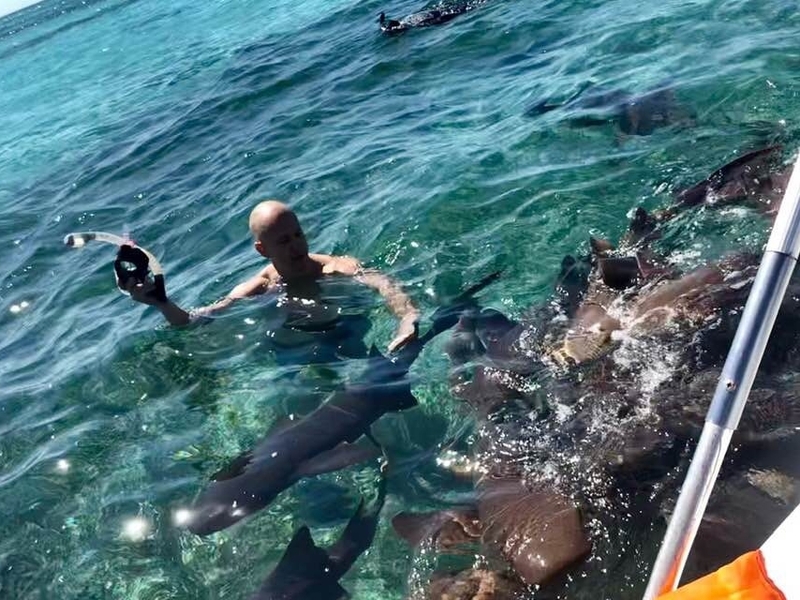 For $35 USD we got a full 4 hours of once-in-a-lifetime snorkeling of the Caye Caulker Marine Reserve, including Caye Caulker Coral Gardens and Caye Caulker Shark-Ray Alley. I made good friends with an awesome 5 foot long green Moray Eel at the first stop on the first snorkeling trip and decided I’d stay back and work on day two. But, don’t pass up “once-in-a-lifetime”. Do it at least once! #6 - Schedule your days so you can enjoy the beauty of Caye Caulker! There are so many amazing things to do on the island. I highly recommend you schedule your work hours ahead of time, making sure you spend 11am - 3 pm enjoying the island of Caye Caulker, Belize when you can see all of the beautiful wonders and meet all of the awesome locals, ex-pats, colorful salespeople, and backpackers that call the island their home. Take a beachside walk to see all of the plants and animals. 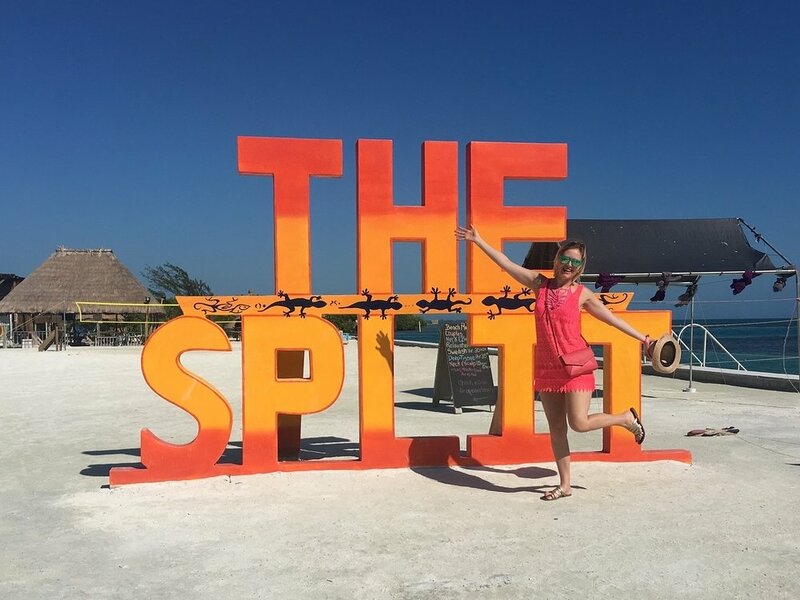 Grab a drink and a game of pick-up sand volleyball at The Lazy Lizard at The Split, the happening meet-up for travelers of all kind, especially back-packers and people trying to do some day drinking. Eat ALL OF THE CEVICHE! I did. Every day. For 7 days straight. Lobster, conch, octopus, shrimp. The shrimp ceviche from Reina’s (on center street) was my favorite. Visit the local animal shelter or try to befriend the chickens and white guinea that hang out on the beach. Go to Koko King Beach and feel like your at a resort for a day. This is also the only place on the island where you can walk straight from the beach into the water. Click here to see what awesome events Koko King Beach has planned! Watch the sunset at The Split! #7 - Don’t bother brushing up on your Spanish or using the names of the streets. You’ll never use any of it. Be prepared to never speak Spanish, even if you speak it fluently. Belize was an English colony until 1981. English is the official language, and on Caye Caulker, since tourism is their primary industry, speaking English is especially important. So, even though many of the locals speak Creole or Spanish in their home, you’ll pretty much only hear English spoken to or around tourists and travelers. We got a special kick when a Dutch couple we met talked about how frustrating this is, as their English isn’t every good, but they both speak Spanish fluently. They said they’d been speaking Spanish to everyone, and locals pretty much only respond in English. #8 - Don’t bother learning the names of the streets, either! There are three streets - Front Street, center street and back street. Front Street - where Ice and Beans, all of the street vendors, and most of the tourguides are. Back Street - more delicious food and islander neighborhoods! Seriously - good food is everywhere! 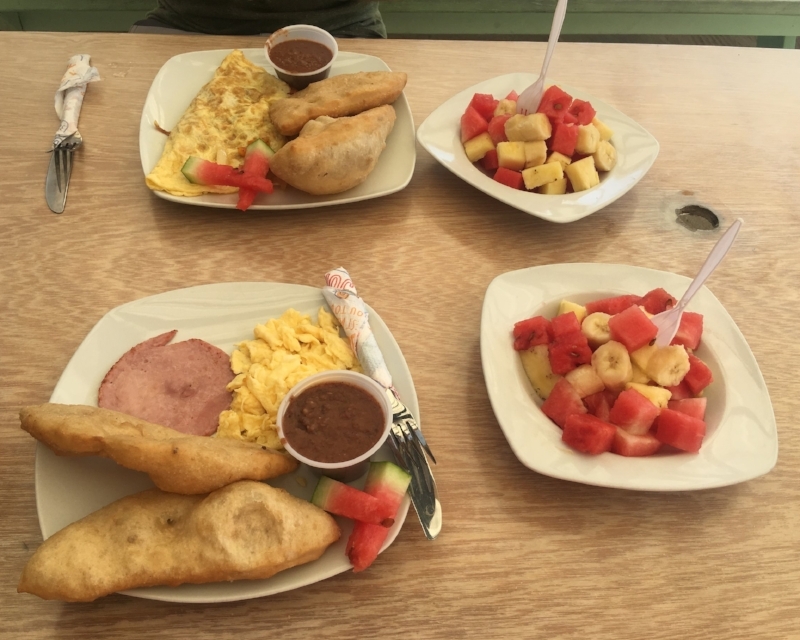 If you’re looking for lobster dinners for under $15 USD, grabbing a drink and some ceviche on the beach for a break between work stints, and access to all of the iffy wi-fi while exploring a beautiful, safe island, Caye Caulker is the place to do remote work! We recommend it, and would love to go back for longer than a week!